Your garage is one of the largest storage spaces in your home. Whether you’re storing tools, outdoor gear, camping equipment, holiday ornaments, or all of the above, it’s easy for this space to become cluttered and disorganized quickly. It may seem like a daunting task to finally clean and organize this space in your home, but once you do, you will feel accomplished and at peace knowing that everything has a place and is easy to find. At Just Store It! in Johnson City, we have a couple of locations that offer different sizes of storage units with different amenities. As you clean and organize your garage, you may discover you don’t have as much space as you’d like to store all of the belongings you’ve been keeping in your garage. If this is the case, contact us today to reserve a storage unit. 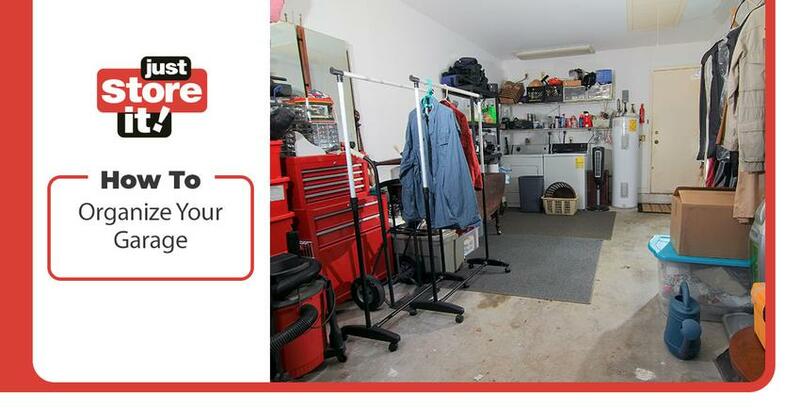 Organizing your garage is not a one-person job. You’ll be moving a lot of things around and may need help with heavier items. Enlist your partner, your roommates, your friends, or all of the above to tackle this job more quickly. When you put your plan together, make sure to include how many people you’ll have helping so you can give them jobs throughout the process to continue working efficiently. Now that you have a plan and a team, it’s time to get started. Start by removing everything from your garage. You don’t have to start organizing yet, but if you have an idea of what categories you’ll be organizing things into, you may decide to start putting things into piles on your driveway. The main goal is to get everything out of the garage so you can clean. Now that your garage is empty, it’s time to do some cleaning. Generally, a quick sweep with a broom or once-over with a shop vac does the job. Keep an eye out for debris like nails or stains from oil and other chemicals. Make sure to get these items picked up and removed while everything is out of the way. It’s also important to keep an eye out for signs of pests so you can set traps as necessary. One of the reasons you’re organizing everything is to make sure your belongings stay in good condition, which pests can threaten. You may discover you have different categories depending on your belongings, but keep things broad enough so that everything has a place to be stored that makes logical sense. Now that you have everything organized into piles, you can decide how best to store and organize everything in your garage. An important thing to think about is items that you’ll need access to regularly. These items should be stored at eye-level so they’re easy to find. Beyond that, storage options are up to you. You can store tools on a peg board or in a toolbox, hang cords on hooks or stack them in boxes, store equipment and gear in storage bins on shelves or in cabinets — whatever works best for your belongings. Don’t forget to leave a space for vehicles if you park in them in the garage! Now that you’ve decided how to store everything, it’s time to purchase the hardware and storage containers you need. It’s best to wait until you know how much you have to store so that you know how large of bins you’ll need and how best to organize and store everything. Now that you’ve taken inventory of everything in your garage, you’ve probably discovered a few things that you can get rid of or store somewhere else. Create piles for trash and piles for donation; take these items to their appropriate locations. As for items you’ve decided need to be stored somewhere else, you have a couple of options. Maybe you have a different area for storage in your home that these items can be kept in. If not, a storage unit is a great option. At Just Store It! in Johnson City, we have storage units to accommodate a variety of storage needs. We are committed to customer service and providing clean, secure, and convenient storage, so contact us today to reserve a storage unit.